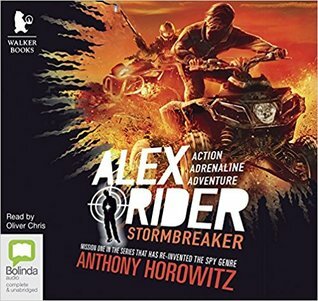 Last month I fancied a bit of a trip down memory lane and thought that I would listen to the Stormbreaker audiobook. 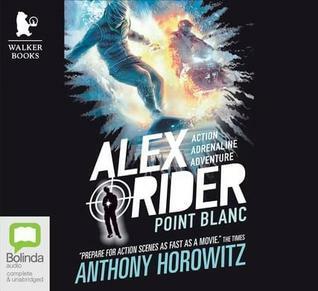 Having owned both the first six books of the Alex Rider series in paperback and audiobook, it was fair to say that I quite enjoyed them as a child. This is the review of the first two books in the series, Stormbreaker and Point Blanc. I quite enjoyed this book as while the premise (a teenage spy) is obviously quite fanciful it felt realistic. The training and tech presented in this book felt like something that would actually happen. The political background concerning the use of a 14-year-old as a spy and the weapons that he should handle felt like it matched the British attitude to such events. In the same school of thought, the bullying and racism that motivates the villain in this book is a very real thing that is quite understandable for children to understand. I felt that this added to the book as it was a lesson that the target audience could understand while also providing a thrilling story. The characters in this book were quite developed and everyone had fairly detailed backstories. I did feel though that some of these backstories could be explained more as some of the characters had unexplained and unexplored annoying character traits. Hopefully, these will be resolved in future books. The second book in this series is a little less credible than the first, but still in the realms of the possible. This school for the sons of rich men seems to be too suspicious to be allowed to continue. I also felt that the evil plot was unlikely to go unnoticed. I felt like the villain should have taken more care. I liked the further character development in this book but felt that some people like Jack and Mr Blunt should still be developed further. At the moment I feel like I know more about the minor characters that appear in each book than I do about theses repeating figures of the story.